The manuscript seems to be in a neat condition, and shows no signs of holes. However, the scribe made some mistakes while copying. In the first line he scraped a word away and in line 2 it seems he had to erase an abbreviation mark above the /n/ in the word “fan”. Elsewhere, the scribe forgot a word, and inserted this interlinearly. This is the word “dot,” in between lines 4 and 5. The scribe does not use much punctuation; three times alone he added a dot at the end of a line. More notable is the scribe’s use of two kinds of abbreviation marks. First, he uses a short horizontal bar above a vowel to replace a nasal sound. It is used on several vowels to replace the nasal sound /n/. The scribe uses the same abbreviation mark above a consonant in line 3; here it takes the place of the nasal sound /m/. He also uses this abbreviation mark in line 4, but here it is used in a different way. It is found in the middle of the word and replaces two letters, /er/. The second abbreviation mark the scribe makes use of is a marker that resembles a seven (“7”), which is used for “and” and which can be found in lines 2 and 7. The scribe does not make use of capitalization. At first glance, it seems he used a capital /h/ in line 4, but upon further inspection it is only a more exuberant lower case letter. The text does not seem to have a particular form, although almost all of the lines end on /is/. The lines are not the same length, and they differ in the number of syllables. On the folio as a whole, a paragraph marker appears at the beginning of each text and there are also some small hands, called “maniculae”. The poem continues at the bottom of the folio, but in a much clumsier hand; many words have been smudged. The text seems to be a warning or lecture. It is addressed to somebody who passed away and is now laid upon a bier. The words addressed to this body are not kind. It reminds the deceased that in life he or she was too idle and selfish. He or she “changed [..] clothes three times” in one day and prepared food in sweet sauces. This was seen as profane. Moreover, he or she only thought of him or herself, and let poor people stand outside in the freezing cold. Now that the body is all that remains, the addressee has to repent and accept the consequences, for he or she is no longer welcome in Paradise. The poem can be placed within the general category of religious-moral poetry—a type of writing that was common in the Middle Ages. The goal of such poems was to remind people to live a good religious life in order to prepare oneself for the afterlife. Such poems were used by monks and priests for study, but also to instruct their congregants. These poems can take different forms, one of which is the ubi sunt formula, which was common in classical literature and in some Old English elegies. They are meant to underline the ephemeral nature of life by pointing to the death of famous and rich people. Another motif is the contemptus mundi, where worldly joys are cast aside in favour of more permanent heavenly ones. For this motif, too, there are examples in both classical and Old English literature. A text along this line is a lyric which is found in different copies but with a consistent basic structure: “Earth upon earth”. This poem features the “dust to dust” motif, in which all of man’s actions are depicted as futile, given the prospect of death. A similar poem is “When the turf is thy tower.” Moralizing poems appealed to the spirituality of readers in order to elicit higher thoughts, often contrasting the crude reality of a corpse with worldly pleasures. The poem translated here serves the same purpose; it confronts the reader with the transcendence of mortal life, comparing it to the life cycle of a tree. This manuscript seems to date from the last quarter of the thirteenth century. This lyric is made of nine verses with a number of accented syllables. All verses rhyme with each other and have the same ending in ‘is’.The language seems quite ordinary—not particularly refined or learned. The poem is written exclusively in English, without any insertions in Latin or other languages. The manuscript was copied in the West of England, and the dialect has been identified as West Worcester, although it shows some Northern characteristics. Typically spelling in this dialect retained some archaic elements from Old English, like the ‘thorn’ (þ) and the sign to abbreviate ‘and’ (7; ll. 2,7). The third-person endings in this poem are somewhat shared between Southern and Northern dialects: makit, hauit, dot. The Northern ending in -es is not visible in the present text. There is a prevalence of -i in places where an –e is expected: makiit (maketh, l. 4, 6), robin (roben, l.2), icomin (icomen, l.3), noldist (noldest, l. 8). There is one instance of third person plural (hem), which follows the Southern / East Midland pattern, in contrast to the Northern pronoun “them,” which was derived from Old Norse. One typical Northern feature that appears in this poem is ‘sal’ (instead of ‘shal’, l. 5). So the dialect appears to be in a sense intermediate, containing some Northen and some Southern forms. The spelling is occasionally inconsistent or contains errors. For instance, “þu lettis,” appears instead of the expected “lettist” (l. 7). Past participles like i-comin (l.3), y-makit (l. 6), and for-lorin (l. 9) are written as two separate words instead of one. Some words seem to be spelled incorrectly and have been corrected in the translation. ‘Consis’ (l. 6), for example, is probably a miswriting of ‘confis’ or ‘confit’ and ‘joþe’ (l.9) is probably a mistake for ‘joye’. The Wanderer. Edited and translated by Elaine Treharne. In Old and Middle English c.890-c.1450: An Anthology, 54-61. 3rd ed. Oxford: Wiley-Blackwell, 2010. The Seafarer. Edited and translated by Elaine Treharne. In Old and Middle English c.890-c.1450: An Anthology, 60-66. 3rd ed. Oxford: Wiley-Blackwell, 2010. Earth upon Earth. Many versions exist, for instance: Lincoln, Lincoln Cathedral Library MS.91. Treharne, Elaine, ed. and trans. 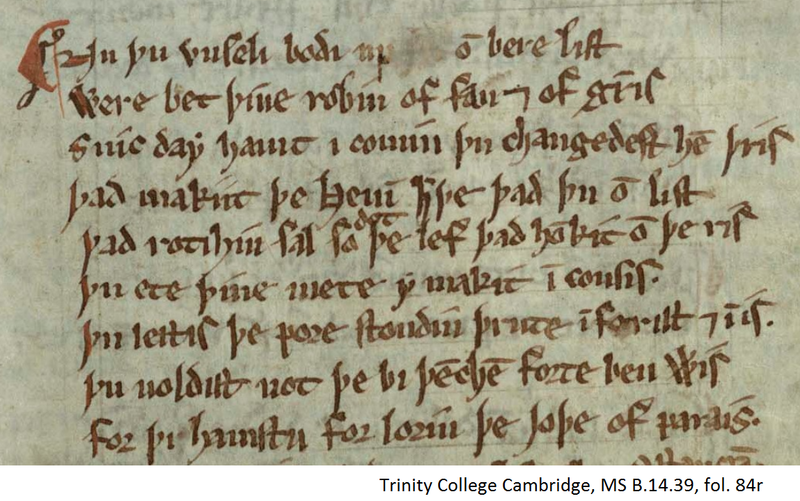 Lyrics from Cambridge, Trinity College B.14.39. In Old and Middle English c.890-c.1450: An Anthology, 506-511. 3rd ed. Oxford: Wiley-Blackwell, 2010. Horobin S. Chaucer’ s Language. 2nd ed. New York: Palgrave MacMillan, 2013. Malvern, Marjorie M. “An Earnest “monyscyon” and “þinge delectabyll” Realized Verbally and Visually in a “Disputacion betwyx þe Body and Wormes”, a Middle English Poem inspired by Tomb Art and Northern Spirituality.” Viator, Periodicals Archive Online, 13, (1982): 415-443.
of the Master and Fellows of Trinity College Cambridge. þu ete þine mete y makit i(n) consis. Þu lettis þe pore stondin prute i(n) forist (and) i(n) is. For þi hauistu for lorin þe ioye of parais. Where are your clothes of brown and grey? that shall rot as does the leaf that hung on the twig. You ate your food made with sweet sauce. You let the poor stand outside in the frost and ice. You did not want to think of yourself in order to be wise. For this you have lost the joy of paradise.